Rantings of An 80s Nut: We Need A Fence Or To Sell A Vote? We Need A Fence Or To Sell A Vote? Historically, cultures that have come to another country for work and not tried to assimilate have drawn the ire of the natives. Although the success of immigrants abroad usually creates a bigger backlash, keeping up language and social barriers puts them in a perilous spot. Germans living abroad suffered after World War I and II. Those successfully farming in Russia were told to stop teaching classes in the German language, end printing newspapers in their former country's tongue and cease gathering in secret groups. After World War II broke out, these immigrants were forced out of the country as some were believed to be drumming up support for the Nazi cause. Businesses were taken from them and many were sent to their deaths in the cold harsh elements. Russia wasn't the only one that treated Germans this way but restrictions on schools, newspapers and social groups were created in Brazil and even in the United States. This same thing happened to many cultures including the Jewish, Lebanese, Chinese and eastern Indians. Those that don't assimilate become resented for their success, what they might be saying or teaching in their language and even outward appearance. These thoughts have been on my mind during the recent marches by those supporting the rights of illegal immigrants. I've been waiting to see things come to a head in our country as they are now. Personally, I'm stuck in the middle. The marches have shown me more than I expected. People carrying the Mexican flag as they try to show the United States that they are patriotic? (Being born in Sacramento, California, if I were to wave a state flag, I would hoist that of Nevada as it represents me as a Nevadan.) I've even seen signs saying that they are just taking back the property the U.S. stole from them. Ignoring the outcome of the Mexican - American War is not helping their case. I personally believe that we have a lot of people that don't want to or can't physically or mentally do work in our economic system. In February, we posted a 4.8% national unemployment rate. Many of the jobs being taken are entry level set at our minimum wage standard. Many of the other jobs are ones we have little record of seeing that if I pick someone up to do yard work and pay him in cash, taxes aren't reported nor collected. So, I'm not against a guest worker program if it will keep track of who we have in our country, push towards assimilation, accurately increase tax revenue and lessen the strain put on our education system. But, I also believe that giving amnesty to those that broke our laws promotes more of the same. (This year, I hope we can forgive anyone that broke the speed limit... no points on your license and no fine. How will you drive next year?) Amnesty would also buy a lot of the Hispanic vote come election day. Do good fences make good neighbors? Sure, to some extent but if one neighbor has to watch the fence more than the other, something is wrong. I hate the whole situation as I like my friends that have come to work over here. I also dislike racism with a passion. Right now the United States Senate and House of Representatives are redefining what being an "American" is and the future will only tell if history repeats itself. First, I just want to say what a great job you did communicating your thoughts on this controversial topic. Second, I agree with you. I feel sad for the legal Mexican immigrants who came to the US for a chance at a better life. Those that have worked hard to learn our language, abide by our laws and obtain legal residency. They have a right to be here just like immigrants from everywhere else in the world. To see people marching in the streets with Mexican flags and demanding their rights - people who have broken our laws - is a disgrace to all the Mexicans that are here rightfully. I love your speeding ticket analogy. Why not apply amnestiy to ALL laws broken just to be fair? We have to be fair at all times to all people under all circumstances, right? Well, living in Texas, I see a lot of this. We had a lot of kids skipping school and marching on city hall. 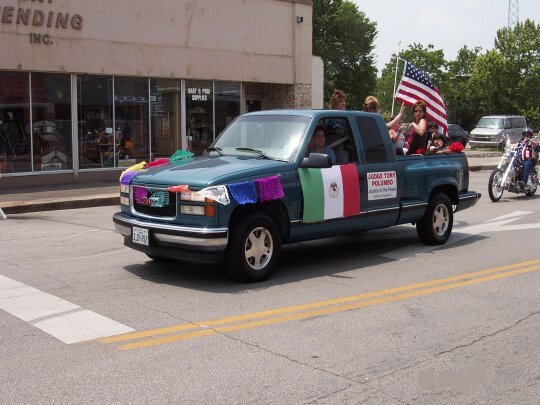 They were carring the Mexican flag and screaming, "Viva Mexico". Don't they realize that they are in America now. Shouldn't they be carrying the American flag? Why didn't they march after school. Now the schools are trying to decide how to displine them. What a mess. I don't mind the Mexicans that come over here legally. They do their best to assimulate into our life style. Many of the illegals, come here and send most of their money home to Mexico. They take our "free" education and medical care and they don't pay taxes. They claim that they have a right to do this. I read the other day, that illegals working in our country, and sending money home, produced 1/3 of Mexico's income. President Fox has put out a book on how to enter our country and not get caught. I bet you didn't know that on Mexico's southern boarder that they shoot to kill anyone entering their country illegally. Hummmm....isn't that interesting. I'm about ready to see a wall built to keep the illegals out. If Pres. Bush wants to allow "guest workers", then they can register as such and pay taxes. If our country wants to allow more of these people in, then raise their quotas and let them in legally. As you can see, I have my feelings on these issues. When my husband and I were newly married and we had our first house, we had a neighbor that was living on our street that couldn't speak English. They spoke fluent Spanish, but they didn't even try to learn the English language. Their young son, mowed our yard and he spoke English, that he learned in school, and he would interpert for his parents. Good line about both neighbors having to mind the fence. And a good essay overall. I'm contributing to the debate by eating a Chipotle burrito. Yum. I still need to go to Chipotle's. I was waiting forever for them to open one and when they did, I had already moved to the other side of town. I'll do it soon though. What a wonderful lesson in current affairs. I had not had the chance to keep up on this one, but feel totally updated and informed now. Thanks. And whereas I hate to be an "us vs them" thing, and abore racism, I tend to agree with Lucy. I have a friend who has been dating an illegal. He works construction, for big builders, and sends most of the money home, or uses it to support his family here with him, while they do not work. The only one speaking good English of the bunch is his niece, who goes to school here. Oakland Wanted A Quarterback In The First Round?